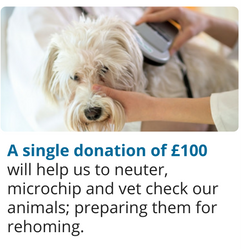 Help to give a homeless animal another chance in life. 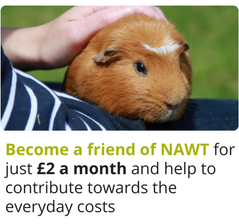 Sponsor an animal from as little as £2 a month or make a one-off donation to help more animals like Bowie, Barry and Lucky (stories below). 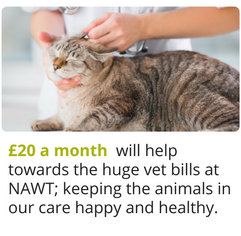 Sponsor an animal and you’ll receive a welcome letter and certificate, a postcard from the animals at NAWT, a biannual newsletter from your local rehoming centre offering you an update on the animals you’ve helped, two editions of our supporter magazine Animate per year and a selection of NAWT merchandise. 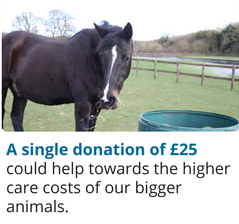 You can also sponsor an animal as a gift for someone else. It’s a perfect present for any animal-loving friend. Bowie the Husky cross came in as a stray via a local pound. On arrival it was obvious he had a skin condition; it looked incredibly sore and he was clearly suffering from irritation causing itchiness so we immediately took him to see our vet, where he was treated with spot on for fleas and tested and treated for mange. Luckily, he responded very well to treatment and his skin improved every day, with the help of regular baths and antibiotics for the infected skin. Bowie, now called Chewie, is adapting to life in his new home and his skin condition has improved greatly. 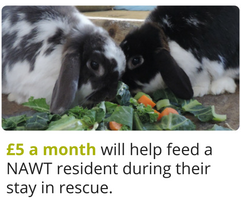 During his time with us, one of our volunteers, James, fell head over heels in love with Bowie. 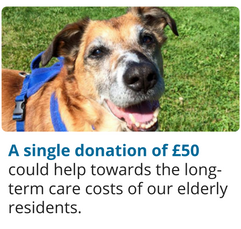 So much so that he made the decision to give him a forever home as soon as he was well enough to leave the centre. Bowie has now been renamed Chewie and is thoroughly enjoying life with James. His skin is almost completely healed and very gradually his fur is beginning to grow back with new colours coming through and making his coat even more beautiful. Chewie had lived a bit of a sheltered life prior to coming to the centre and had never seen stairs before, so James has been taking the time to teach Chewie how to walk up and down the stairs; something he was a bit apprehensive about at first but is now completely confident with! He has also been using their many long walks in the countryside to introduce Chewie to all sorts of everyday things that we take for granted, such as rivers and canals. When he’s at home, Chewie loves standing at the back door to watch the local foxes in his garden when they come to visit and despite the lovely brand new bed James has bought him, Chewie can mostly be found making himself at home on James’ bed! 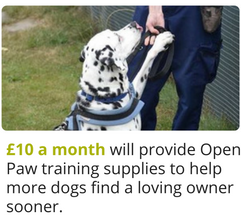 We’re so thrilled to see Chewie now enjoying the happy life that every dog deserves. Barry the Jack Russell has a similar story to Bowie. He also came in as a stray; possibly from the same home or area as Bowie because they were found straying together, but Barry’s skin was a lot worse in appearance. He was completely covered in fleas; so much so that you could see them crawling in his fur, making his skin look much darker than it actually is. 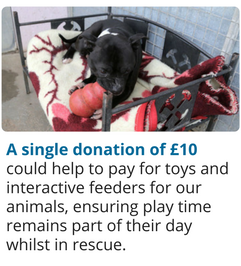 Thanks to our supporters Barry received the treatment he needed. Poor Barry was so sore and red all over his belly and perineal area. He had terribly sore ears due to constant itching. On top of that he was suffering from a deep infection on his back leg which made him lame and his persistent scratching had caused him to fracture his nail, which meant that he also had to have his nail stripped. Barry was clearly in desperate need of some care and attention when he arrived, so the team immediately booked him in with the vet, where he was treated with a few courses of antibiotics to clear his infection and an anti-inflammatory injection to reduce his skin inflammation. The Animal Care team then got to work bathing him regularly with medicated shampoo to improve his poorly skin and made him more comfortable with regular pain relief. Thanks to our dedicated team, Barry began to improve in no time and it wasn’t long before this beautiful little dog found himself a loving, new owner. We were excited to wave Barry off to a much brighter future with his new owner and are confident that going forward he’ll have the happy life he deserves. Lucky is a blind cat who came into our Clacton centre on 12th June 2015. 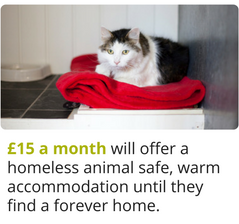 5-year-old Lucky adapted to cattery life reasonably well and enjoyed socialising with the other cats at the centre, but he ideally needed an experienced owner in a settled environment so that he could get used to new surroundings. Lucky's really come out of his shell in his new home. Lucky lived up to his name when he was spotted by Karen, who already owns another blind cat and fell head-over-heels in love with Lucky. So off he went home with Karen on 12th June 2016, precisely one year after arriving in our care. Lucky’s really coming out of his shell in his new home, is much more relaxed and is very talkative!